← ArtXpress–The Mural Lives On! Francesco Solimena (Italian, 1657–1747), Madonna and Child with St. Januarius and St. Sebastian, ca. 1700. Oil on canvas. Milwaukee Art Museum, Gift of Friends of Art M1964.35. Photo credit: Larry Sanders. A number of artists featured in the special exhibition Of Heaven and Earth: 500 Years of Italian Painting from Glasgow Museums are also represented in the collection of the Milwaukee Art Museum. This is the fifth and final in a series of blog posts that will highlight Milwaukee’s paintings during the run of the exhibition. The black death. It terrorized Europe for centuries. Although the knowledge of modern medicine means that plagues are not widespread today, the power of disease and its strain on society is still evident. In times of stress, we often turning to tradition and religion. In an earlier blog post, we explored this reaction in 14th century Florence through our painting by Nardo di Cione. The Milwaukee Art Museum has another artwork in the collection that illustrates this response in late 17th century Naples. The painting is Madonna and Child with St. Januarius and St. Sebastian by the great Baroque artist Francesco Solimena (Italian, 1657-1747). (Solimena’s work is also featured in our current exhibition, Of Heaven and Earth.) The Milwaukee painting—because of its large scale (over 8 feet tall! )—was most likely envisioned to be an altarpiece for a church. The active yet elegant composition forms an arc with the most important figures, the Virgin Mary and Jesus, at the apex, perched on top of a cloud. Below them on the left is St. Januarius (a bishop who was martyred around 305 AD); on the right is St. Sebastian (an early martyr who was shot with arrows). All of the figures are classically modeled, surrounded by billowing drapery and lit by a glowing light—it is clear why Solimena’s style made him the preeminent artist of his time. But there is more going on in this altarpiece than just two saints showing their devotion to the Virgin Mary and her son. Look at the emotion in their poses. The head of St. Januarius tips up, his hands held together in prayer, his legs extremely active almost in a lunge. Meanwhile, St. Sebastian’s expression is earnest, and he holds his arms dramatically outstretched. These saints are beseeching the holy pair, who respond by looking directly down into St. Sebastian’s eyes. Both St. Januarius, the patron saint of Naples, and St. Sebastian, who despite being shot of arrows was nursed back to health, represent divine intermediaries for suffering humans. Their supplication of the Virgin and Child is on behalf of the people of Naples, who were battling the plague in the years around 1700 when this painting was made. Just imagine: when installed in a church, the viewer would stand in front of and below the painting in order to pray. The two saints would pass the message to the Virgin and Christ. The power of the painting is emphasized by the life-size figures. It becomes less an object to look at than an experience to take part in. When thinking about the experiential aspect of our Solimena painting, it is much easier to understand how its emotional and spiritual power could help to counteract the pain and stress caused by the plague that ravaged Europe for hundreds of years. 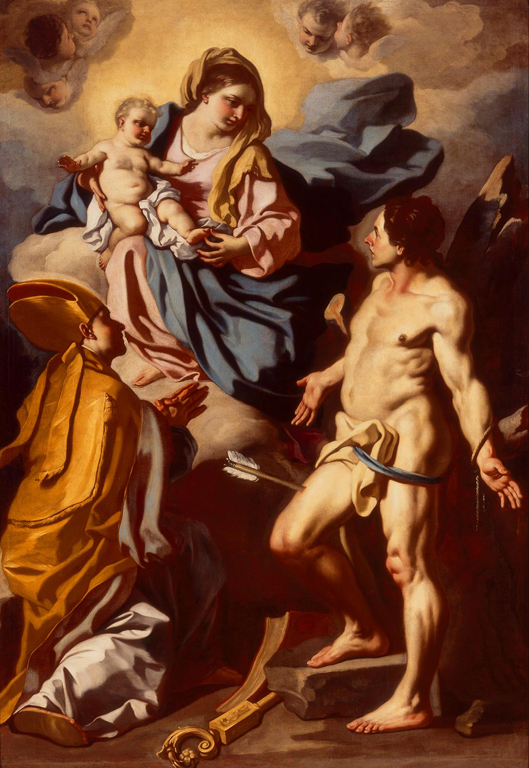 If you’d like to learn more about this subject, its historical context was explored in a 2005 exhibition at the Worcester Art Museum, which included Madonna and Child with St. Januarius and St. Sebastian. With the holidays upon us, evidence of the value of tradition is all around us. The end of another year encourages us to take a look at the past in order to understand the present–and give us hope for future. When our collection galleries reopen in 2015, you might see the Milwaukee Art Museum’s painting by Francesco Solimena. In the meantime, you can see an example of Solimena’s work in the feature exhibition Of Heaven and Earth: 500 Years of Italian Painting from Glasgow Museums, on view at the Milwaukee Art Museum through January 4, 2015. This entry was posted in Art, Curatorial, Exhibitions and tagged European art, From the Collection. Bookmark the permalink.